Way back a long long time ago, last Spring, my husband submitted a proposal to speak at this year’s North American Biodynamic Conference. 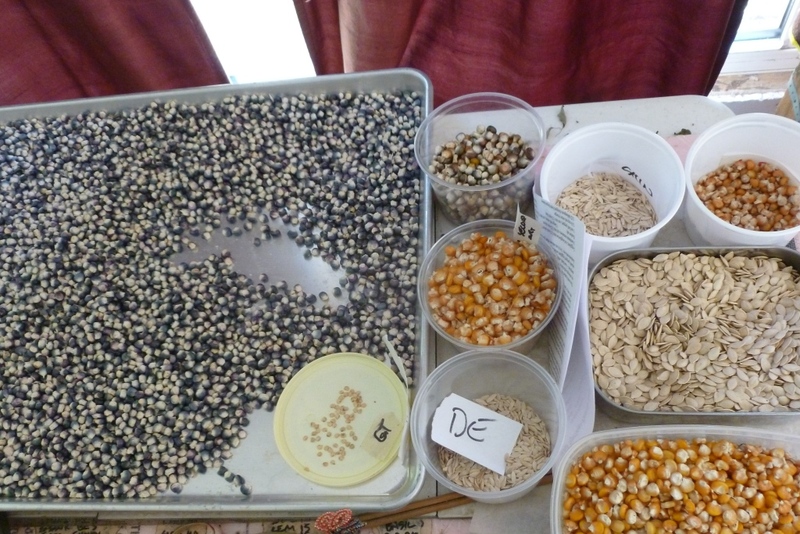 He proposed to speak about seed saving, a topic near and dear to his heart. When summer rolled around and the Biodynamic Association announced their decisions about who would be presenting and when, we were pleasantly surprised to see that they had paired him with another grower who also had a love of seeds and had submitted a similar proposal. Cory Eichman farms up in Durham, Ontario. The two set up a phone meeting and began exchanging emails. Our family travels to Ontario, Canada nearly every Autumn, to visit Paul’s family and take a break from the everyday flow. 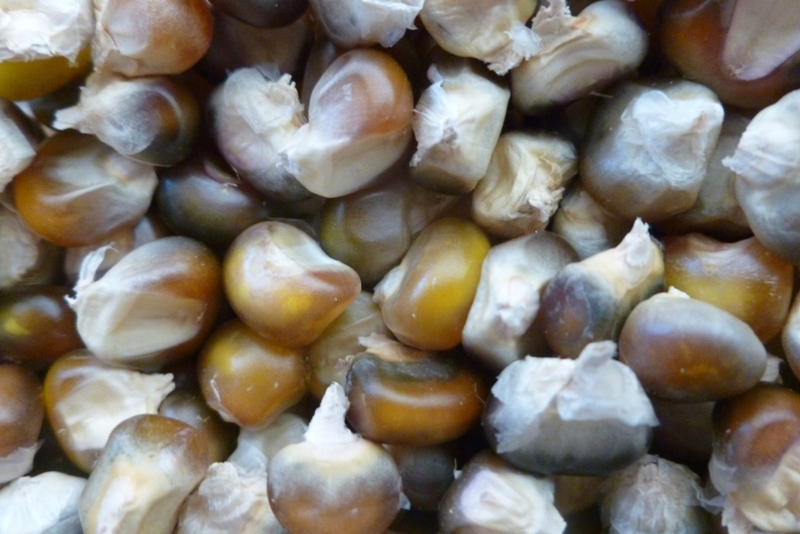 Almost every year we have talked about exploring Ontario’s farmland, and even looking up some biodynamic growers in the area and making a connection. But by the time we pack up the season, and pack up the family for a ten day trip, we are too tired and harried to pull of the extraneous effort of reaching out to some veritable strangers and asking them if we can bring our tired bodies and grumpy, road-weary children to visit them. So, it just never happens. Until this year. The opportunity for Paul and Cory to connect in person before the conference was too good to pass up, and considering how long we had been intending to introduce ourselves to some of the Ontario biodynamic growers, we made arrangements to stop in Durham on our way to Toronto. Then, there came the frost warning. We had spent a frantic week trying to get our (much neglected) house whipped into shape for our lovely house sitters, and finishing the outdoor work (as if it is ever really finished), and we were already moving as fast as we possibly could when the wind started whipping through the clear blue sky and the forecast low for the night sank deeper by the hour. We had hoped to get on the road in the early afternoon. But there were bushels of beautiful peppers and eggplant still hanging on the bush, and at least a half bushel of dried beans, that would all go to waste if a freeze caught them. So we stayed and worked that day, departing near dusk, and driving into Ohio in the dark cold night. Road trips with children are nothing short of an adventure, and the tenor of that adventure depends a great deal on proper sleep, food, and exercise. It took awhile to get across that Canadian border, though it probably didn’t take quite as long as it FELT because a tired and excited eight year old quizzing her parents about how much longer it will be until we get there every fifteen minutes makes the road feel longer than it is. 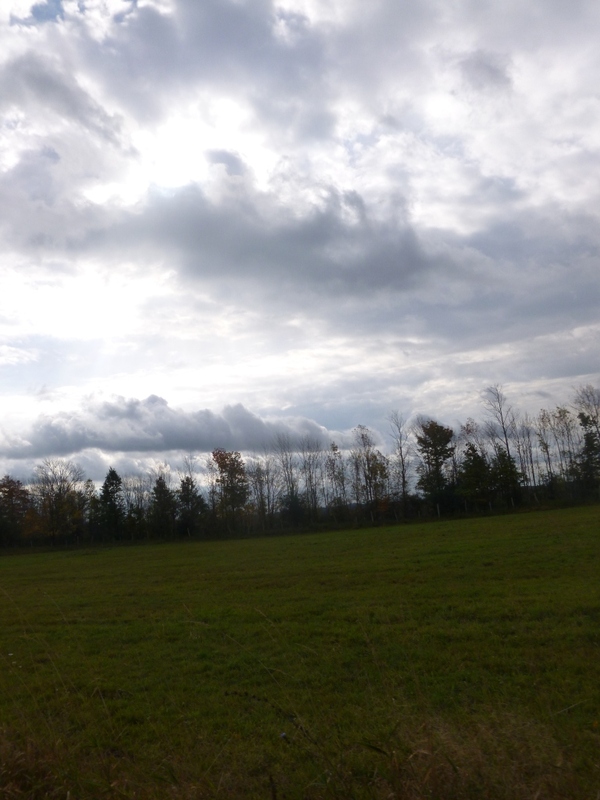 We arrived at the Saugeen River CSA bleary-eyed with weary barefoot children dragging at our sleeves. The Eichman/Coulters welcomed us into their warm family home and sat us right down for a bowl of soup and good bread. It was all wonderfully familiar – children, land, nice folks, and warm good food. The children began to play. Levon, at three years old, has no problem breaking the ice when there are new toys and playmates involved. Soon all four kids were engaged in fun times, and the adults were involved in the kind of talk that happens when meeting new and interesting people for a limited period of time. We talked about local schools, light-weight politics north and south of the border, the price of good land, farming in partnership within the family and with other families. Cory introduced us to the conceptual framework he has adopted for managing his farm, and the evening flew by. Saugeen River CSA is largely horse powered. And by that I mean that it is powered by some very large horses. At dusk, Cory took us out to watch as he put the horses in the barn. 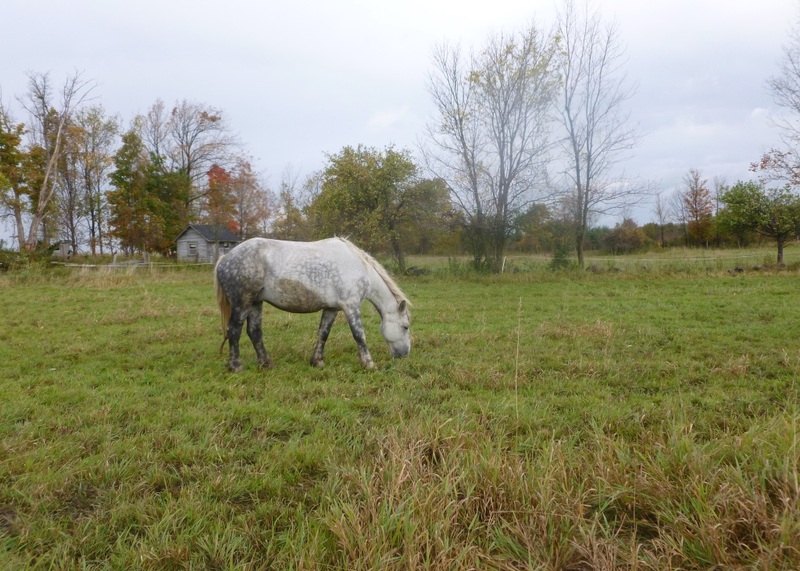 He has two pairs of working horses – a pair of Belgians and a pair of Percherons. We were awed by their size, and Lulah thrilled by their gentleness and the velvety feeling of their muzzles as they snuffled her hand. Paul and I enjoyed the tour through the century-old barn. We had driven past hundreds of them on our trips through the Canadian countryside, but I, at least, had never managed to see one from the inside. They are huge, made to hold the contents of large farms and all their livestock through the long, cold Canadian winters. Their lofts are high and their floors are strong. The foundations are stone and block. They are magnificent structures, the likes of which we do not see in the southern U.S.
We were all relieved to be in company of other folks who enjoy early bed times that night. The next day was drizzly and the kitchen, bustling with the children getting ready for school, and warmed by a wood fire, was a welcoming place to start the day. Once the children departed for school and Tanya to work, we went back out with Cory to walk the gardens. 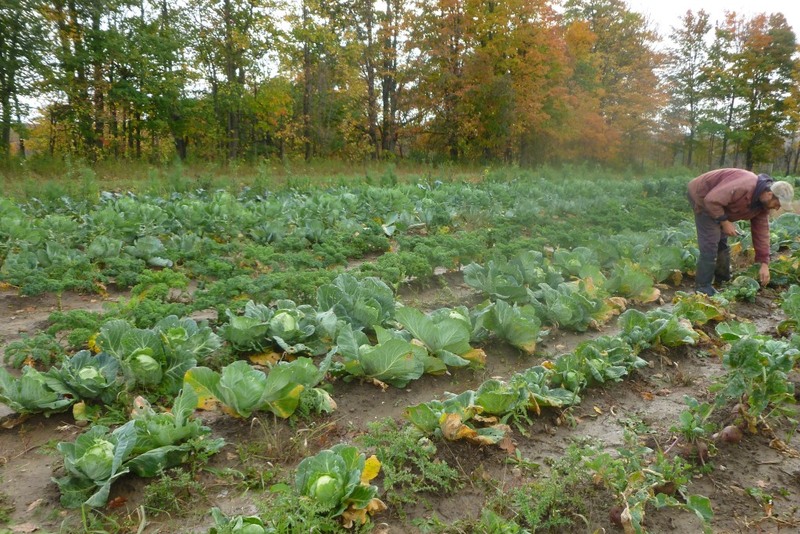 It was wonderful to see the black soil of southern Ontario put to such good use. The gardens, even so late in the season there, were productive and lovely. 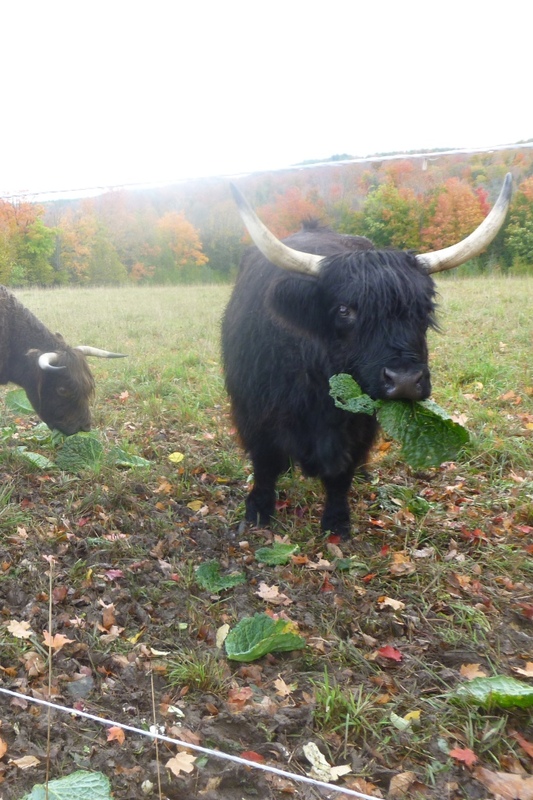 Cory cut some old cabbage leaves and we walked out to bring the Highland cattle a few treats. Lulah and I thought the cattle looked like something between a yak and a bison. They are beautiful shaggy creatures with flowing forelocks and tails. On the way back through the gardens, Cory generously loaded our arms with kale and chinese cabbages to supplement our vacation food supply, while we examined the horse-drawn equipment and pinched the dark soil between our fingers. We laughed at how few visible rocks there were in the field, and then nodded in solidarity when Cory showed us the pile of small boulders he has hauled from the field. We all have rocks, after all. Just different kinds. Back in the warm house, Paul and Cory sat down to look at the Power Point pictures and talk about their presentation while the kids and I washed dishes and played. Our stop at the Saugeen River CSA was short, but sweet. It was funny when both Cory and I would respond to the calling of our shared name. It was a delight to watch our children meet and play so easily. 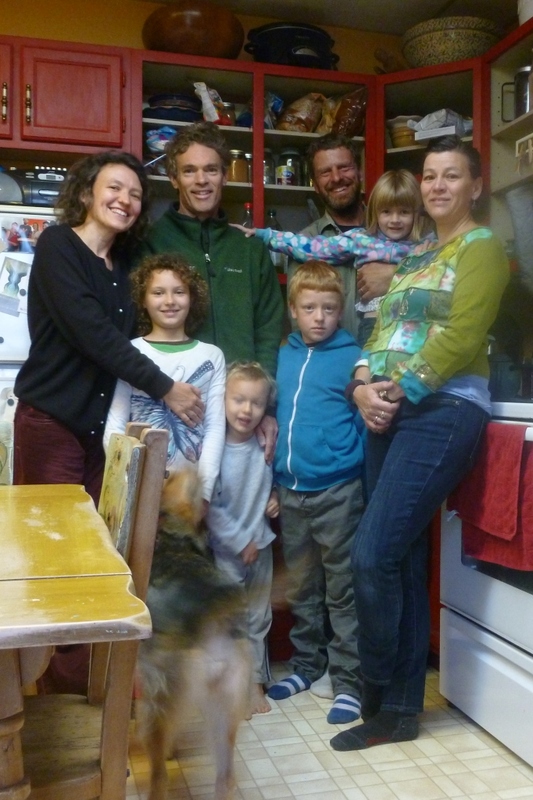 It was refreshing to meet another creative farm family, making their way, and to compare notes on our fellow journeys. It made me grateful, again, to be doing what we do. There is much to be gained by meeting our distant neighbors. We stretch and grow through these good experiences. And really, we can never have too many friends. 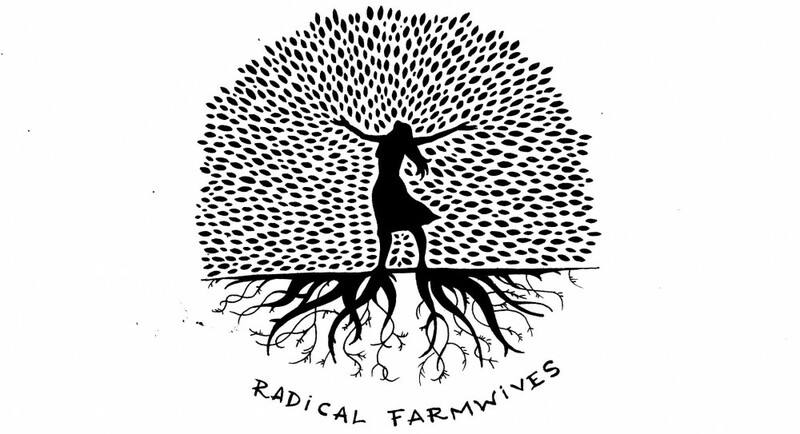 Come out to the North American Biodynamic Gathering to see Paul and Cory’s presentation, not to mention the Radical Farmwives exploration of A Woman’s Eye View of the Farm. This entry was posted in coree's posts and tagged autumn, biodynamic, biodynamic association BDA, Canada, conference, CSA, friends, vacation by Coree. Bookmark the permalink. What a special delight to see and hear about that really cool meeting….all the photos were terrific!